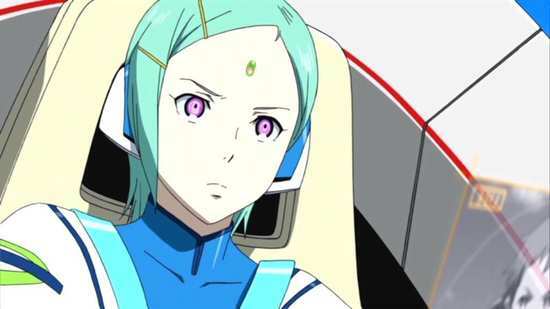 Has it really only been two months since the release of Part 1 of Eureka Seven AO? It actually feels much longer, which must no doubt be testament to how much I was enjoying the series by its halfway point. It’s also an indication that at this point, the story has begun to fade from my forebrain, the characters are slipping from my mind. That’s normally an excuse to watch the series again from the beginning, but the vagaries of reviewing being what they are, I don’t get that luxury. Hopefully it doesn’t take me too many episodes to get back into the groove with Eureka Seven AO, and I also hope that it manages to stay 9/10 good all the way to the end of its run. It’s the near future in the independent nation of Okinawa. But on one of the islands, a young boy named Ao has a difficult upbringing, living with his adoptive grandfather, ever since his mother left when he was still a child. The islanders never trusted his mother, the woman who fell from the sky, and brought calamity with her, and that mistrust has transferred to Ao as well. Of course some of that is transference, as Okinawa hasn’t had an easy road to independence, and life isn’t easy in a region still jostled over by the local powers, particularly Japan and China. Part of that jostling is for military control as well, particularly the possession of an IFO known as the Mark 1. Japan has it, and they need certain components from Okinawa to complete it. 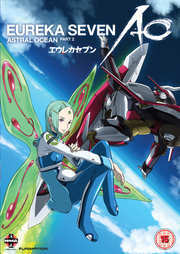 The concluding episodes of Eureka Seven AO are presented across two discs by Manga Entertainment. 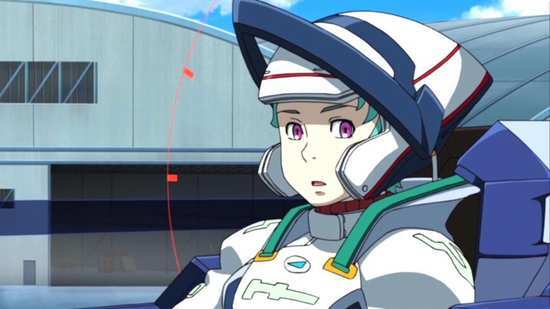 Eureka Seven AO gets a 1.78:1 anamorphic transfer on these discs, which courtesy of Madman Entertainment in Australia get the native PAL treatment, along with 4% speedup. It’s a pretty nice transfer, clear and sharp throughout, with few visible signs of compression, and only a tiny bit of shimmer on fine detail at the limits of the DVD format. 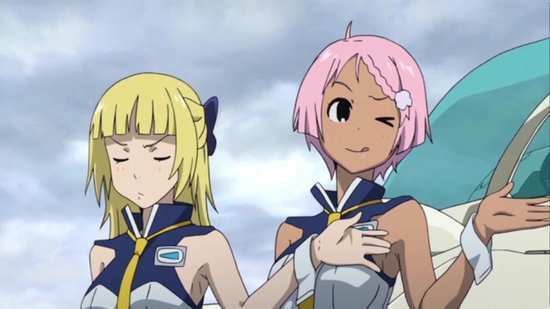 It’s a good thing too, as Studio Bones have made a vibrant animation, rich in both character and background detail, with some really fluid action sequences and a grand scope. It also up-scales pretty well with just a smidge of edge enhancement. There are issues with the size of the on screen text captions that appear, announcing each location in this world spanning story. The English text is a little small, and due to some poor subtitle placement, is often obscured if you are watching in Japanese with subs. This is definitely one show that needs a Blu-ray release to do it justice, and I hope that Manga choose to revisit it in the future, as they did with Fullmetal Alchemist Brotherhood. You have the choice between DD 5.1 English and DD 2.0 Japanese, with optional translated subtitles and a signs only track. I went with the original Japanese audio, which has some really strong voice actor performances to it. 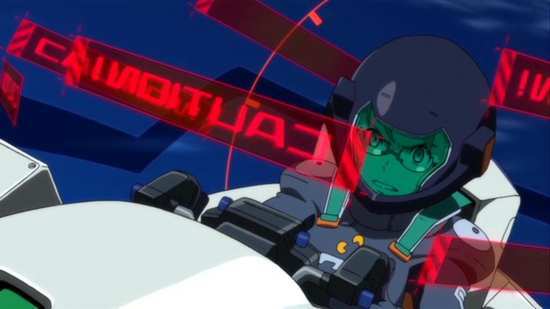 The action comes across well enough through a stereo set-up, particularly with a little Prologic applied, but Eureka Seven AO really does impress when it comes to the show’s music, both the theme songs and the incidental tunes. It really delivers something beyond the usual action anime clichés, and it’s certainly a selling point of this show. I gave the dub a brief try, and it seemed to work well enough for the purpose (although I doubt I could bear the pronunciation of Ao as ‘Ow’ for long), and the 5.1 upmix certainly gives the action sequences a little more oomph. I did notice the telltales of pitch correction though. The discs present their content with static menus, and have jacket pictures to look at when at rest in compatible players. The sole extra feature on disc 1 is the audio commentary for episode 13 featuring Stephanie Sheh (Eureka) and Todd Haberkorn (Truth). It’s another pointless, meandering waste of disc space. What has the forthcoming zombie apocalypse got to do with this show? Before you think that they don’t mention the show at all, they do occasionally remember to throw in a few spoilers, so don’t listen to this until after you’ve seen the entire series. Disc 2 gets 5 Promotional Videos in a 10 minute presentation. There are 4 opening and 2 closing songs given the textless credit treatment, and you get the English language trailer. This disc also sees commentaries, two of them. Episode 24 gets an audio commentary with Micah Solusod (Ao) and Jonny Yong Bosch (Renton) joining ADR director Zach Bolton for a pretty mellow conversation. Episode 21 gets a Video Commentary however, again with Zach Bolton, but this time with Jad Saxton (Elena Peoples), Brandon Potter (Gazelle), and Nathaniel Harris (Noa and sound mix engineer), which starts off a little rabbit in the headlights before settling down to a fairly sedate picture in picture commentary, and as I mentioned in another review for a show with a video commentary, the usual Funimation inanity is easier to handle when you can both see and hear it taking place. Hold on tight, it’s going to be a wild and bumpy ride! 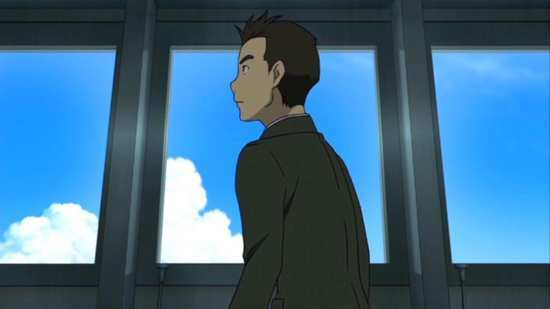 The conclusion of Eureka Seven AO is a fast paced, action packed thrill ride from mid-point to end. 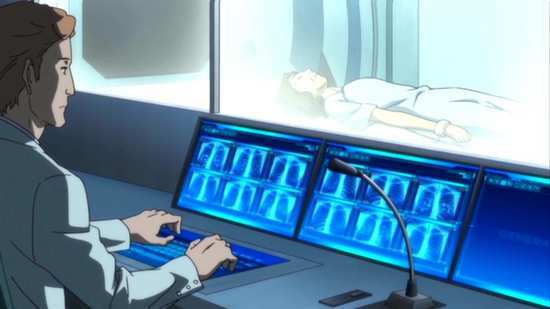 It’s one of those shows which make sure to deliver on jaw dropping moments per episode, and its ethos is to keep topping what the previous episode accomplished. I believe ‘more cowbell’ is the colloquial term. Once you’re up to speed on what Part 1 was all about, and you settle down to watch the concluding half of the series, it’s an entertaining blast all the way to the final frame, with the show maintaining the quality of its animation and production values, and the characters remaining engaging throughout. But it is like grabbing a tiger by the tail. You just have to hold on for dear life as it goes through its paroxysms of plot advancement, getting ever more fantastical with each new episode. Just don’t stop to think about it. I did stop to think about it, and it quickly became clear that Eureka Seven AO’s second half is a victim of the ‘throw everything including the kitchen sink at the screen’ school of story development. The first half set things up in a very fascinating way, with its tale of an alternate world where humanity was plagued by, and where technological advance was driven by the appearance through history of Scub Corals and Secrets. It set up the politics and national identities in this world with care, introduced the Generation Bleu extra-territorial force which held the balance of power when it came to dealing with these situations, and introduced an interesting cast of characters, with a whole collection of mysteries and back stories to hold the attention. 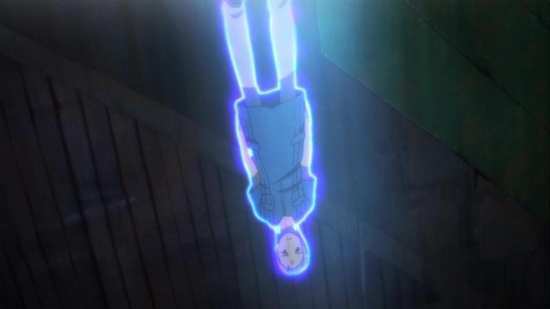 There was Ao’s past, his mother Eureka, and her disappearance ten years previously, there was his childhood friend, Naru, and her mysterious coral related illness, there were the various members of Generation Bleu, and as part 1 concluded, the enigma around one Elena Peoples suddenly intensified. There was the strange Truth, malevolent and super-powered, and the various inter-relationships between all of these characters. 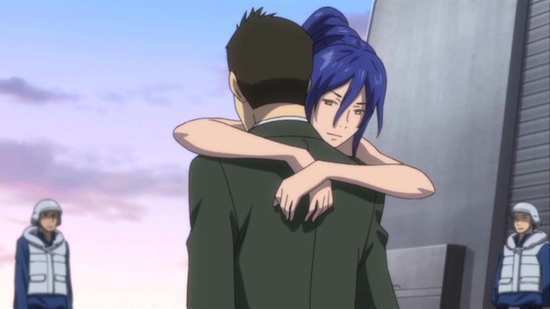 Part 1 left us poised at a tantalising moment when Eureka suddenly reappeared in Ao’s life. Let’s face it, this is more than enough mystery to be going on with, and I was expecting Part 2 to set about the process of resolving some of these mysteries, start building up towards the conclusion. But this isn’t enough for Eureka Seven AO, as with Part 2 it continues to throw more ingredients into the pot. The result being that those questions that might intrigue from Part 1, are dropped like a chewed dog toy in favour of the new plot twist of the week, and if they do get picked up again, they’re most likely resolved in a passing, inconsequential manner, and at a time when you’ve probably forgotten them anyway. Instead, like a tech geek, the show revels in playing with the new plot twist toy of the week, ecstatic in its fervour until the next new plot twist comes along. 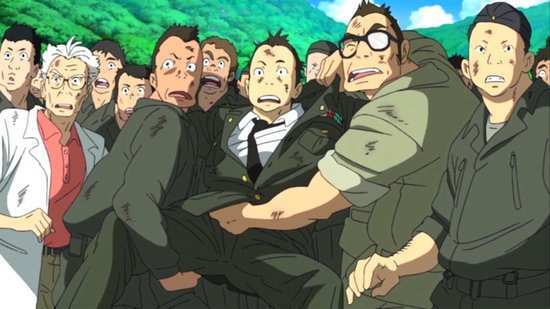 And as I’ve mentioned in many such anime that lose their way, there comes a point where the sheer volume of plot twists overwhelm to a degree that you just become inured to them. 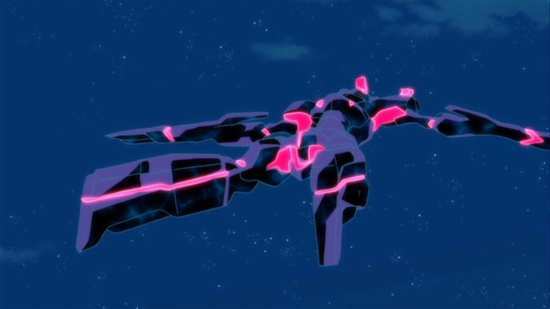 By the time Ao picked up his BFG that changed the very face of reality every time he fires it, I’d given up with the story for Eureka Seven AO, and was only really tuned in for the pretty visuals, and the ephemeral excitement. It had turned into a Michael Bay movie! 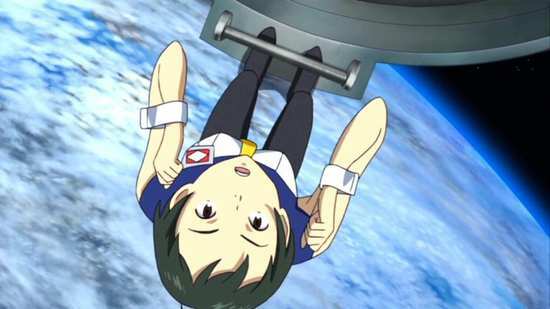 Like a theme park ride, Eureka Seven AO’s second half is all about the visceral thrills, and the story gets neglected as a result. But it is fun while it lasts, and not every anime has to go on the timeless classic shelf. It also finishes off on a positive note with an entertaining and goofy OVA episode, which sees team Pied Piper having to hide from the press, going on a whistle-stop tour of Switzerland to do so, and having Ao disguised as a girl to complicate matters. Fun, but forgettable.